Harwell, Oxfordshire, UK, 10th January 2019. SIAP, the Secretariat of Agriculture, Livestock, Rural Development, Fisheries and Food - part of the Mexican Ministry of Agriculture (SAGARPA) - has signed a declaration of intent with the UK Space Agency to provide historic, statistical and satellite data to support Rezatec’s development of a crop yield optimisation tool for Mexican farmers and other supply chain stakeholders. The Mexican COMPASS project is funded by the UK Space Agency under its International Partnership Programme (IPP) – a five-year, £152M initiative which is using the UK space sector’s research and innovation strengths to deliver a sustainable economic or societal benefit to developing economies around the world. 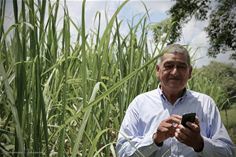 The project is designed to utilise sophisticated geospatial data and Artificial Intelligence to help smallholder farmers growing sugar cane and wheat in Mexico to improve their crop yields. The inclusion of SIAP in the project will enable the provision of new and valuable information relating to wheat and sugarcane background studies in Mexico, historical data, surveys, statistical information and access to future satellite data, all of which will help improve the project outputs for the farmers. As part of IPP, Rezatec unveiled the latest version of its free mobile app, ‘COMPASS V1.6’, at the Global Agri Food Tech Forum in Puebla, Mexico in October 2018. The event, the largest of its kind in South America, was attended by 40,000 agricultural stakeholders - ranging from smallholder farmers to senior figures within the global agricultural supply-chain, as well as the Mexican President, Enrique Peña Niento. The app, developed by Rezatec, will provide decision-support tools to help growers, including smallholders, improve their technical, environmental and financial performance, delivered via a smartphone interface so that it is accessible even in areas with no internet connectivity. The technology developed by the project will use Earth observation satellite data, along with field data captured by farmers, to help identify factors causing the yield gap between crop potential and actual field performance. SIAP stated that they are delighted to be collaborating with Rezatec and the UK Space Agency on the COMPASS project to improve agricultural outcomes for Mexican farmers and other stakeholders in the supply chain. Chris Castelli, Director of Programmes of the UK Space Agency said, “Collaboration is at the core of our International Partnership Programme. By working together, we are providing the tools necessary to stabilise workers’ incomes and support the economic development of their communities”. Dr Andrew Carrel, Chief Technology Officer at Rezatec commented, “The inclusion of the SIAP in the project is going to be instrumental in the increasing value that we can provide the farmers to help optimise their crop yields and in turn create a positive impact on economic livelihoods”. Version 1.6 of the app offers new functionality for wheat farmers advising them of the optimum sowing period and an irrigation schedule for a maximising yield. Following the launch, additional farmers have now signed up to the project with the help of AOASS, Mexico’s largest wheat farmers association, which has shown huge interest in supporting the farming community in using the application for the upcoming wheat season during December 2018. The next stage of the project is to collaborate with other stakeholders in the supply chain, including crop insurers, wheat processors and irrigation bodies. For more information visit: https://www.rezatec.com/resources/projects/mexican-compass/. Rezatec applies data science to satellite imagery and geospatial data to deliver sophisticated, cloud-based analytics to customers owning and operating high value, distributed land-based assets. Rezatec data services enable improved margins, enhanced competitive advantage and optimised asset management for its customers. Rezatec customers cover the globe and are leaders in their respective industries in the water, agriculture, infrastructure and forestry sectors. For more information about Rezatec visit www.rezatec.com. The Agroalimentary and Fisheries Information Service, a decentralized administrative body of the SAGARPA, is responsible for generating statistics and geographic information on agri-food matters, promoting the concurrence and coordination of the other dependencies and entities of the Federal Public Administration, of the State Governments, Municipalities and of Mexico City, for the implementation of the National Information System for Sustainable Rural Development.